It was a quiet little press release that received very little notice, but told a much larger story. The Mary Ann Liebert, Inc. media company which publishes 60 journals for various health-related groups — from obesity management to genetic engineering — announced last week that Disease Management, the publication of the Disease Management Association of America: The Care Continuum Alliance, was being changed to Population Health Management. The publication will now focus on ethnicity, clinical practice, environment and public health policy to address chronic conditions in the population, said the Editor-in-Chief, Dr. David B. Nash, M.D., a Robert Wood Johnson Clinical Scholar and chair of the Department of Health Policy in Philadelphia. “Although disease management will continue to be a critical component of population health improvement,” said Liebert media spokesperson Vicki Cohn, other things are required to address health care quality, access and outcomes on a population level. Those include “resource management, clinical guidelines, compliance strategies, information technology, and health economics.” Future issues will focus on reengineering clinical processes, provider incentives, quality and return on investments, she said. JFS readers will need to pull out their doublespeak decoder rings to understand what they’re talking about. Wellness* and quality have become buzz words, but as we know, they don’t always mean what we think they do. This announcement brings a new term we’ll be hearing a lot more of: population health. Once you learn about it, though, you may see it more as managing the population in the name of health. The population health improvement model being promoted, according to DMAA’s literature, is a managed care model using a medical home,** with primary physician oversight, and coordination of care with third-party wellness, disease and case management. ● an electronic communication network to share information between doctors, health plan/payers and ancillary service providers. Raised to greater public awareness by a skeptical Congressional Budget Office report in 2004, the debate was further fueled by a 2007 RAND report that surveyed the literature and concluded that the evidence of savings from published DM studies is inconclusive — due partly to the paucity of published evidence, criticisms with study design and rigor, and a mixture of outcomes across different programs, conditions and populations. Few question the ability of disease and care management programs to improve processes of care, adherence to evidence-based guidelines, and clinical outcomes; even the authors of the RAND review concede the evidence for these DM outcomes is consistently positive. What remains in dispute is whether DM programs consistently produce return on investment, meaning short-term net savings for the health plans, self-insured employers, and public sector sponsors who typically pay for these services. Readers of the actual reports, however, likely came away with different interpretations. Hence, the growing backlash, as employers and others paying for DM are not realizing benefits. The evidence for the cost effectiveness, cost savings and impact on improving actual health outcomes were reviewed here. It’s well-recognized among the DM and health insurance industries that DM typically does not lower costs and that the evidence for its effectiveness and future cost savings is limited to specific settings and patient populations, but otherwise problematic, unimpressive, and nonexistent to conflicting. After examining the peer-reviewed studies of DM programs for the most serious conditions, the CBO analysis reported there was insufficient evidence to conclude that DM programs typically can reduce overall healthcare costs. “The few studies reporting cost savings generally do not account for all health care costs, including the cost of the intervention itself,” it found. The most recent Rand systematic review of the evidence, published in the December 2007 issue of the American Journal of Managed Care, questioned if the more than $1 billion a year being spent on DM is a good investment. “In the face of double-digit healthcare inflation, evidence of systemwide poor healthcare quality, and an aging population, disease management seems an intuitively appealing way to improve the quality and reduce the cost of care, as well as to enhance health outcomes for the chronically ill,” the authors began. With politicians and stakeholders enthusiastically claiming enormous potential cost savings, they wrote, the DM industry has grown and is projected to top $1.8 billion this year (2008). But with recent independent reviews reporting insufficient evidence to recommend them, the authors examined fifteen years of recent studies (3,831 papers) and four existing reviews on DM which evaluated clinical processes (meaning: adherence to clinical guidelines), patient compliance to behaviors and medication usage, intermediate lab results, clinical outcomes, healthcare utilization and costs. Overall, the evidence on the role of disease management in reducing utilization of health services was inconclusive, with the following 2 exceptions: disease management was found (1)to reduce hospitalization rates among patients with CHF and (2)to result in higher utilization of outpatient care and prescription drugs among patients with depression. When the costs of the intervention were appropriately accounted for and subtracted from any savings, there was no conclusive evidence that disease management leads to a net reduction of direct medical costs. However, the strength of this conclusion is limited because many studies do not address the issue of cost but focus on quality of care and outcomes; and many studies have methodological flaws such as the incomplete accounting of costs and the absence of a good comparison strategy. Of course, actual patient health and clinical outcomes are what matter most. The Rand summary of the evidence on DM programs for the most acute conditions (congestive heart failure, coronary artery disease, diabetes, asthma, chronic obstructive pulmonary disease, and depression) reported that the evidence for Clinical Outcomes demonstrated either evidence for no effect, inconclusive evidence or insufficient evidence. Until a stronger base of evidence has been developed, public and private purchasers of disease management services should be skeptical about vendor claims and should demand supporting evidence based on transparent and scientifically sound methods. Their findings concurred with other recent reviews, such as a UCLA School of Public Health study published last July in the Annals of Internal Medicine examining comprehensive diabetes DM at 63 physician groups from 11 health plans. That review found that while DM led to more screening and testing, it did not lead to improved control of blood sugars or reduce diabetes complications. As Health Affairs reported last December, many employers and politicians have been led to believe that by focusing on prevention, health risk appraisals and DM, they can keep people healthy and prevent health conditions from reaching higher levels of acuity and hence, save the accompanying higher expenses. However, this appears to actually not be the case. By lessening attention on DM and moving to population health, it would appear the DMAA alliance is abandoning any pretense that DM reduces healthcare costs and improves outcomes among sick people, in order to focus on a larger target market, the entire population… in the call for wellness and preventive health. This is especially noteworthy because DMAA is among the key players in readying medical homes, as stakeholders work towards nationalized healthcare. While many people may be unfamiliar with the name of this organization, they have undoubtedly been affected by its work behind the scenes. The DMAA alliance is a trade group whose members*** make up of leading corporations and industry groups: disease management organizations, health plans, wellness providers, employers, pharmaceutical companies and pharmacy benefit managers, health information technology developers and others. According to its Strategic Vision, its Advocacy work has changed from DM to promoting the population health model as a tool to “reduce preventable health care costs,” although it provides no evidence for that, either. ● S. 1753 Healthy Workforce Act of 2007 — Amends the IRS code to allow employers a 50% tax credit for the costs of providing employees with a qualified wellness program, as defined as a program certified by the Secretary of Health and Human Services. ● H.R. 853 Wellness and Prevention Act of 2007 — Provides loan payment assistance for preventive medicine physicians, establishes a wellness program tax credit for eligible employers and pays up to $200 for participation in a qualified employer's wellness program. ● H.R. 3163 Healthy Americans Act and S. 334 Healthy Americans Act — Requires individuals to purchase health care through state-run programs with subsidies for low-income people, gives premium discounts for participation in wellness programs and for compliance with certain health behaviors, incentivizes medical home primary care doctors with additional fees to manage care, and requires DM programs for all Medicare beneficiaries. ● S. 1455 The National HIT and Privacy Advancement Act of 2007, H.R. 1952 National Health Information Incentive Act of 2007, H.R. 3800 Promoting Health Information Technology Act, S. 631 Remote Monitoring Access Act of 2007, and S. 1693 Wired for Healthcare Quality Act — Various support programs for creating a national electronic health database and electronic medical records. ● S. 1298 Healthy Business, Healthy Workers Reinsurance Act of 2007 — Creates an Office of Federal Reinsurance in the HHS, a reimbursement program for eligible health plans experiencing high costs as long as they offer DM as defined by the DMAA. ● S. 755 Diabetes Screening and Medicaid Savings Act of 2007 and H.R. 3373 Catalyst for Better Diabetes Care — Creates a cross-agency program to increase utilization of the Medicare diabetes screening and creates a National Diabetes Report Card, a national diabetes surveillance program with corollary state information, which aggregates laboratory measures of diabetes and diabetes cases. ● H.R. 4327 Medicare Chronic Care Practice Network — Directs the Secretary of Health and Human Services to establish a Medicare Chronic Care Practice Research Network to develop and evaluate DM and case management for Medicare beneficiaries. DMAA’s Obesity with Co-morbidities Steering Committee and Workgroup has been a leader in making obesity a part of disease management and providing guidance for the National Committee for Quality Assurance (NCQA) [follow links for information]. In 2006, DMAA announced it had created “a new definition of obesity with co-morbid conditions— the first of its kind in the disease management community.” This was the first in a series of products from the DMAA’s “Obesity with Co-Morbidities Initiative” funded by Sanofi-Aventis pharmaceuticals. This initiative provided the foundation for disease management programs to manage obesity as a chronic disease due to conditions associated with obesity (“co-morbidities” sound more serious) and inclusion in the DMAA Dictionary of Disease Management Terminology. 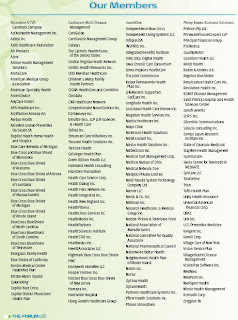 Among the initiatives from this DMAA committee is the annual Obesity Management Summit at the 2007 Disease Management Leadership Forum and the toolkit for employers called “Wellness, Disease and Care Management: Background for Developing a Business Strategy” released in collaboration with the STOP Obesity Alliance. Its most recent program is its “Value-Based Benefit Design for Obesity and Comorbidities” released in May. This is a guide to pricing structures for employers and other health insurance purchasers as they build an obesity benefit program. 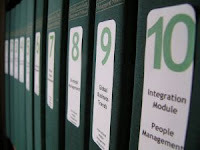 It also provides a “fact book” [their quotations] that summarizes information to help employers “recognize the severe burden obesity places on health and productivity” of their companies. Obesity benefit programs, per their design, include levels of coverage that begin with primary care doctor screening and treatment, diet counseling and obesity-specific drugs and advances to weight loss surgery. DMAA also markets its mission to healthcare professionals in the form of educational conferences. 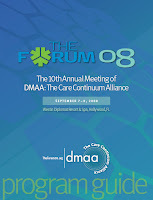 Coming up this weekend is the 10th annual DMAA forum, “The Forum 08,” in Hollywood, Florida, to “convene all stakeholders providing services toward the goal of population health improvement.” While the entire program is heavily sponsored by industry, continuing education credits are specifically provided for nurses and doctors - a whopping 23.75 course credit hours - sponsored by Pfizer, Sanofi-Aventis, Healthways, MEDecision, ActiveHealth Management, HMC and Health Hero Network. There will be a pre-conference Obesity Management Symposium sponsored by Sanofi Aventis, which will feature speakers on workplace and population weight management and tracking, and metrics for monitoring provider compliance to obesity screening and treatment guidelines. Another Symposium will discuss predictive modeling of health care utilization using health risk assessments, claims data, case management and underwriting guidelines. The full program includes seminars on: using risk factor changes to evaluate wellness programs, remote patient monitoring, the state of the disease management and wellness industry, employee wellness promotion, moving towards medical homes, the medical home model focused on preventive care, the current and future market size in preventive services of Japan’s disease management program centered on the metabolic syndrome, online personal health records to increase medication adherence, the DMAA Compliance Committee encouraging health organizations to develop compliance programs, lifestyle health coaching for obesity, international lifestyle programs, an evaluation of adherence to postpartum antidepressants among Medicare beneficiaries using pharmacy claims data, use of biometric screening in employees, a vendor presents the value of health risk assessments in conjunction with claims data to assign a risk score to members and develop a plan of action for them, a certification program for wellness programs, a P4P program to incentivize screening, and managing chronic disease in Medicaid populations. Population health is one of those feel-good terms that’s easy to get behind, but given the evidence, is it most about benefiting the health of people or about benefiting certain bottom lines? here, here, here, here, here, and here. **Medical home posts: here, here, here, here,here,here, and here.